Check out the complete Android / IOS native applications for FLAME. News: Post, and import news easily. Videos:: Post, and import videos easily from YouTube, Dailymation, Facebook, and Vine. Lists: Create unlimited lists such as buzzfeed lists, and lot more! Music: Create unlimited music, import music from soundcloud. Powerful Admin panel: Manage settings, users, lists, videos, news, and a lot more easily from our admin panel. Breaking News: Create Live Breaking News. Amazon S3: Upload all videos, images to Amazon and save bandwidth!. Reaction System: Users can react to posts. Custom Profile Fields: Create custom profile fields for users. API System: Full API system included for third patry applications. Added login with WoWonder API and integration on Flame. (Users can log in to flame using your site that uses wowonder social network platform). Added the ability to add an image on each poll answer. Added load more option to the home page. Added reaction system for news, polls, videos, music, lists, quizzes. Added upload progress bar while uploading media. Added full verification form + verified badge. Added RSS feed export for each section. Added share to email option on all posts. Added the option to import RSS news from any RSS/XML link. Added upload logo, favicon to the admin panel. Added upload video feature on all create pages under videos entry. Added theme system in the admin panel. 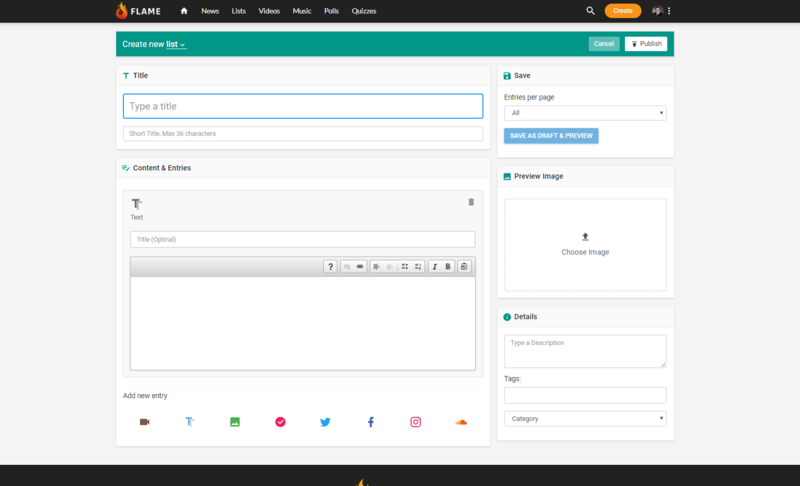 Added complete new powerful admin panel. Added the option to enable/disable news, polls, videos, lists, etc. Added custom profile fields system. Added ban user option in admin panel. Added report system, users can report articles. Added max allowed upload size. Added the option to choose if users can post, or just admin. Added API ID / Keys to admin panel, for the upcoming native application. Added the ability to post without admin review.